Determining how much money one will need in retirement is a mathematically and psychologically daunting task for many Americans. But new research has landed on a deceptively simple strategy for prodding workers to save. 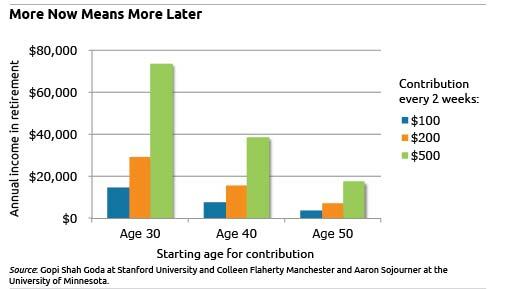 Employees in an experiment at the University of Minnesota saved more for retirement after researchers provided them with a personalized chart with information similar to that shown below. Each employee’s chart translated a $100, $200, or $500 contribution, made every other week, into the amount of income each of these contributions would generate annually once they retired. If they saved more, they could see that it translated to more retirement income. The group of employees who received a chart with income projections in their employer’s information packet increased their contributions to their retirement plans by an average $85 more per year than the group receiving general information. Another $85 a year won’t solve anyone’s severe savings shortfall, but the response was more striking – $1,150 more per year – when the comparison was restricted only to employees in each group who increased their contributions. Manchester, an assistant professor at the university’s Carlson School of Management, also noted that university employees already have a robust retirement plan, which might make them less inclined to save than a more typical worker. The university’s hourly workers receive traditional defined benefit pensions, and savings are mandatory in the defined-contribution plan for faculty and staff. Among the university population, she said, “One reaction could’ve been to reduce their savings” after seeing the income charts. Their positive response just seems to make sense for an intuitive reason. And it’s a deceptively simple and creative approach to a problem that has confounded workers, employers, and policymakers. And you know who are you. To read a summary of the paper by authors Manchester, Gopi Shah Goda at Stanford University, and Aaron Sojourner at the University of Minnesota, click here. Full disclosure: The research cited in this post was funded by a grant from the U.S. Social Security Administration (SSA) through the Financial Literacy Research Consortium. SSA also funds this blog. The opinions and conclusions expressed are solely those of the blog’s author and do not represent the opinions or policy of SSA or any agency of the federal government. When you put money into an IRA or 401(k), you’re not saving but buying…buying retirement time. Every block of time has a corresponding amount of desired income, and your contributions buy those blocks. And the more you save, the more blocks of time you buy. Thanks for this chart. Its always good for a financial planner/adviser to have tools that encourage people to save for their own future security. What a brilliant way to motivate people to save more in their 401(k) and IRA accounts. I do think it is somewhat ambiguous for most people to articulate something as abstract as the translation of a retirement nest egg into actual income. By showing them the numbers on the graph, that spells it out and makes it real enough for all to see. Of course, I’m sure those numbers they estimate are no guarantee since retirement savings are based on so many variables and affected by a number of future events. But all in all, I think its a healthy start and a positive way to reinforce good habits.